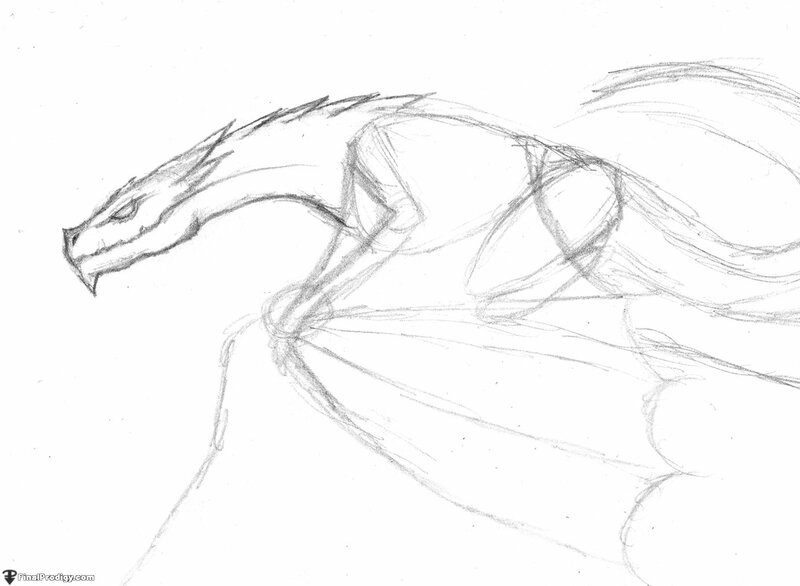 Start out with a light and basic sketch of the wyvern's body using an HB pencil. Keep the guidelines as clean and simple as possible. Build basic forms over the guidelines. Keep the lines light and sketchy. 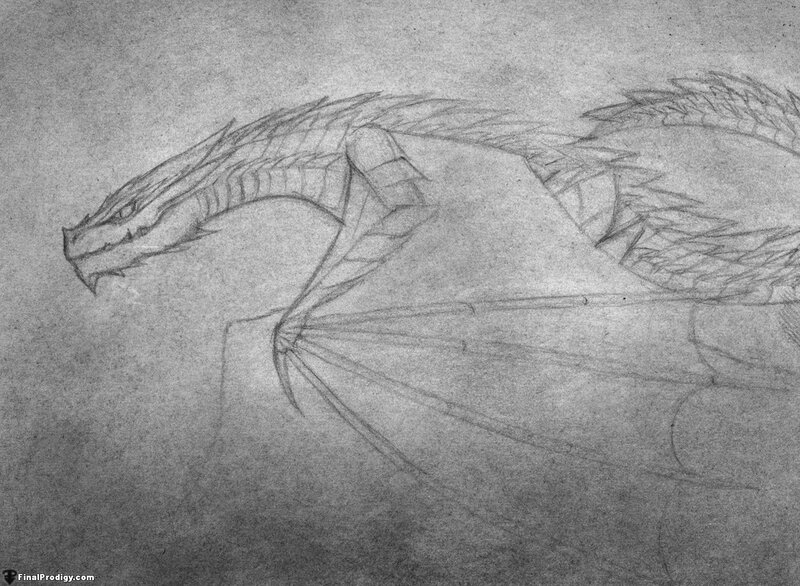 Start adding cleaner, more defined features to the wyvern. Work from left to right. Define the wing. Erase unneeded any unneeded guidelines. 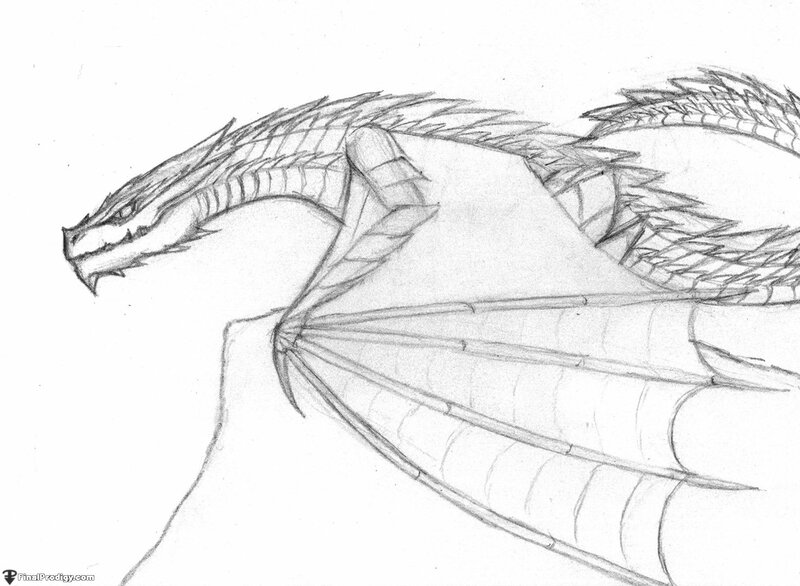 Build upon the features of the tail as well as the cliff that the wyvern is mounted upon. 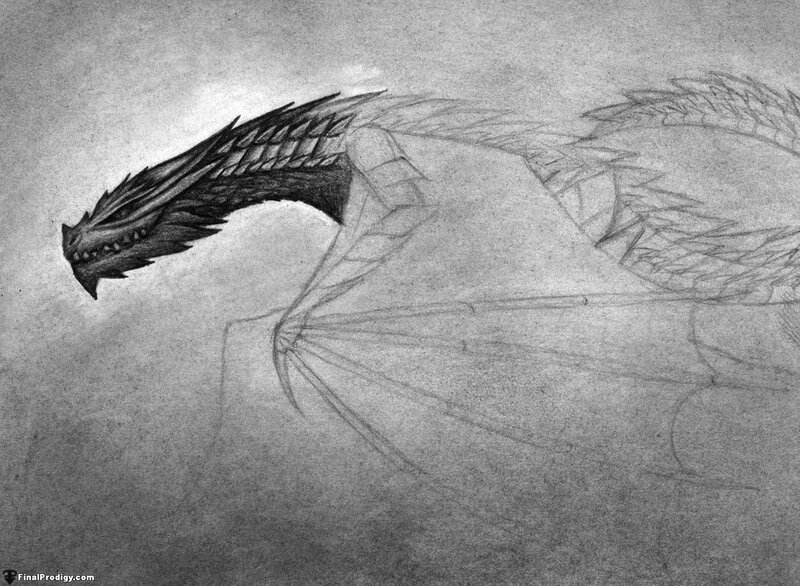 Start adding the next layer of detailed lines from left to right. Make the lines darker and more defined without adding too much pressure; try to produce darker lines without making them permanent and un-erasable. 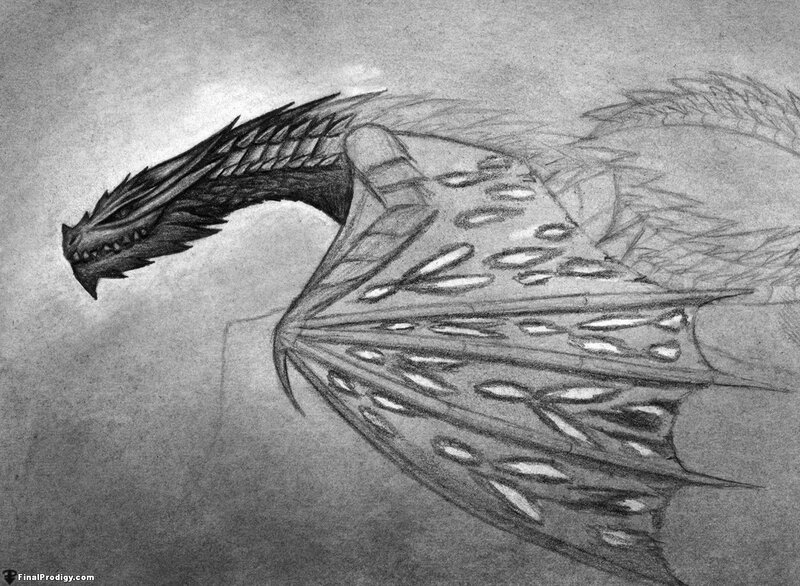 Add some detailed lines to the wings. Add detailed lines to the rest of the drawing. Add a layer of base shading to the entire drawing. There are many ways to go about adding this base layer, the quickest and most effective involves using powdered graphite. Sprinkle a pinch or two of powdered graphite onto the paper and blend it in with a paper towel or tissue. Lightly cross-hatching over the paper with an HB pencil, then smoothing out the shading will produce a similar but rougher effect. Preemptively erase around the edges of the head before adding rough shading. Lightly shade in in the head using 2B or any soft graphite. Add rough shading to the neck. Try not to get too engrossed with the details. The main goal here is to add a layer of shading that will be built upon later. Switch to a sharpened HB pencil and add detailed shading to the head and neck. 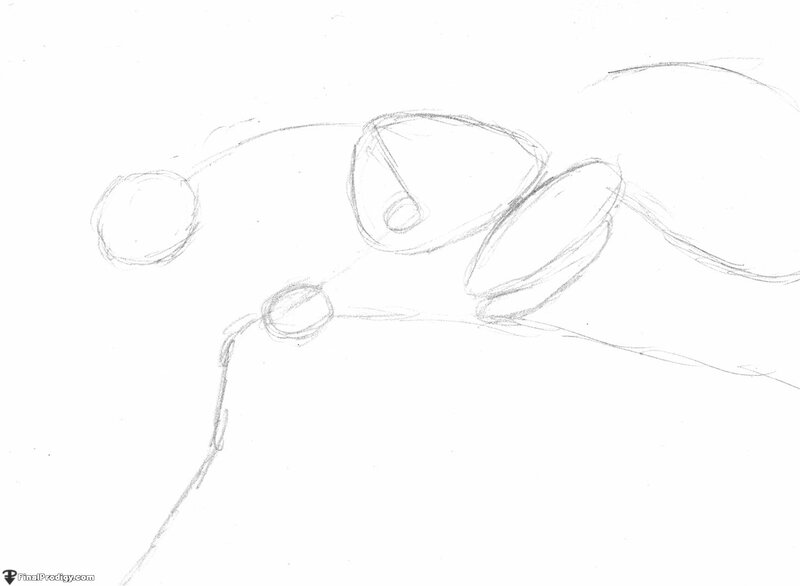 Don't worry about adding the most minute details, just concentrate on defining the main outlines, shadows, and forms. 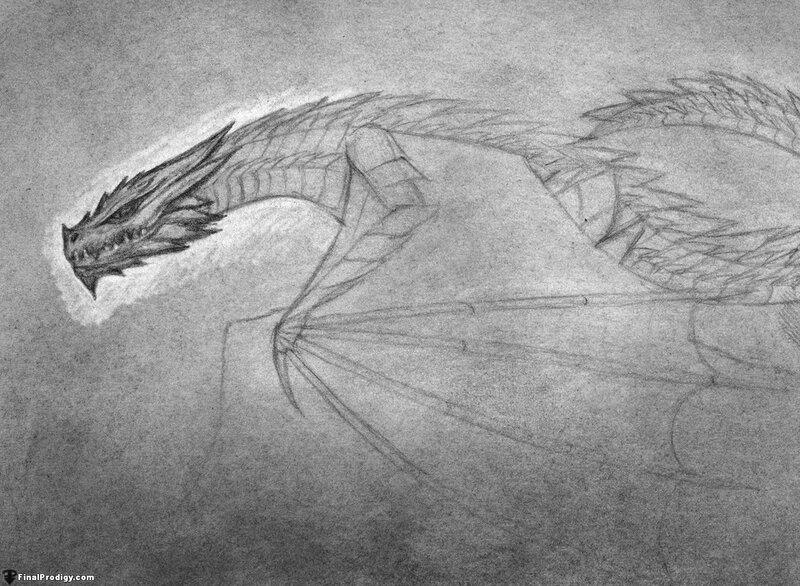 Add rough shading to the wing using a 2B pencil. 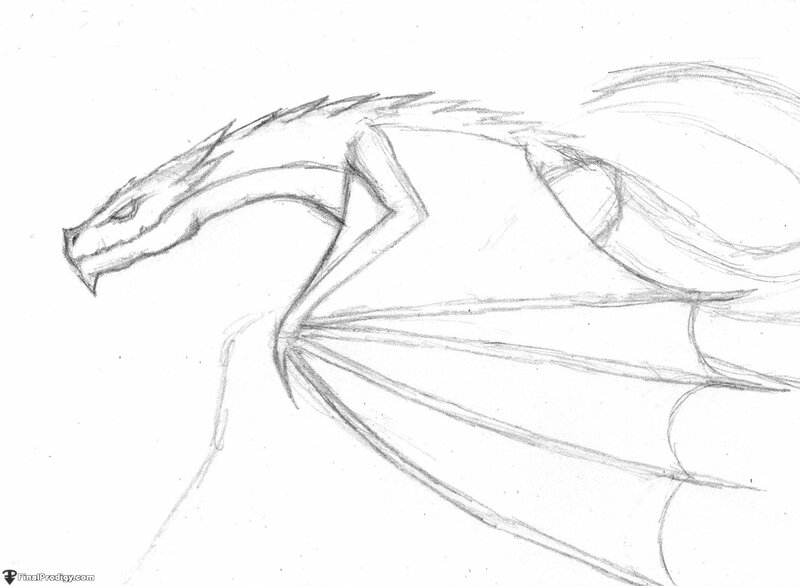 Pattens can be added to the wings to make them more interesting. Let your imagination go wild here. Add rough shading to the cliff. Keep in mind that it will take many layers of shading with a 2B pencil to make the rocks as dark as they are in the finished drawing. 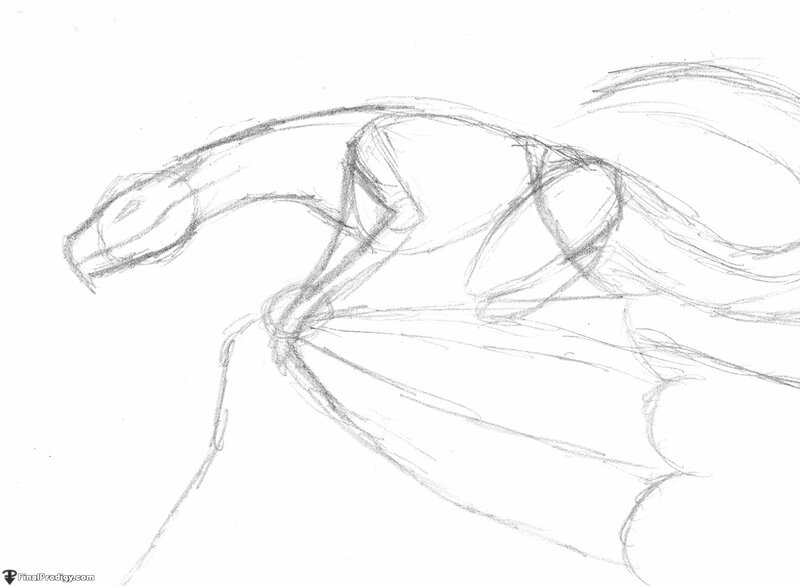 Start defining the wing and cliff shading. Use a 2B pencil to define the cliff and an HB pencil to define the wing. Define the rest of the wing and cliff side. 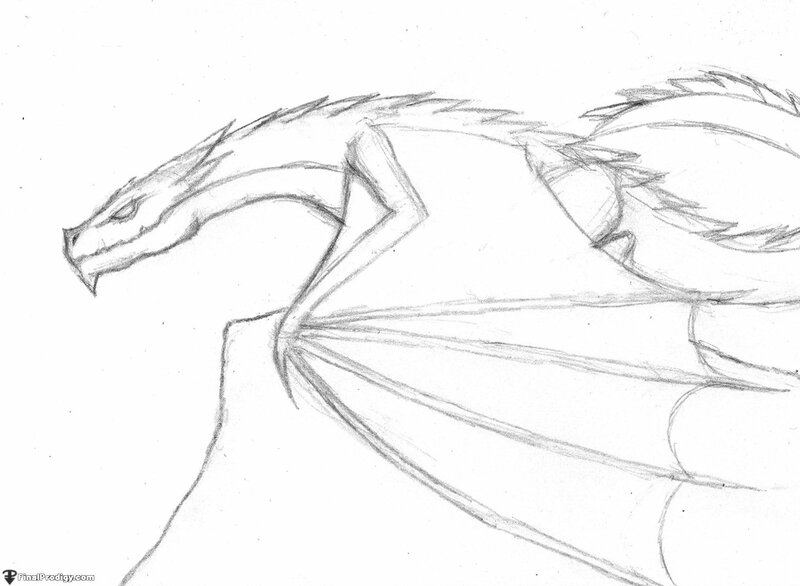 Add rough shading to the rest of the back, hind leg, and tail of the wyvern using a 2B. Build up the shading using an HB pencil. 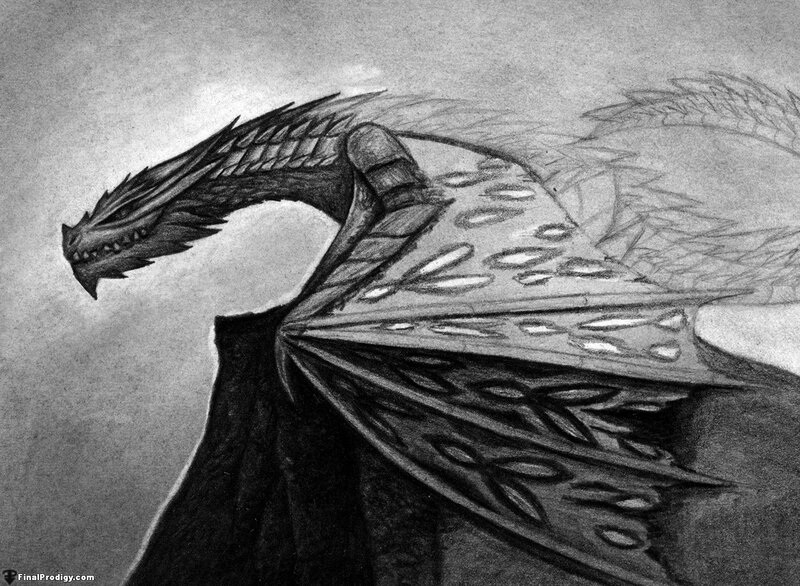 Start adding a final layer of extra details using 2B and 4H pencils. 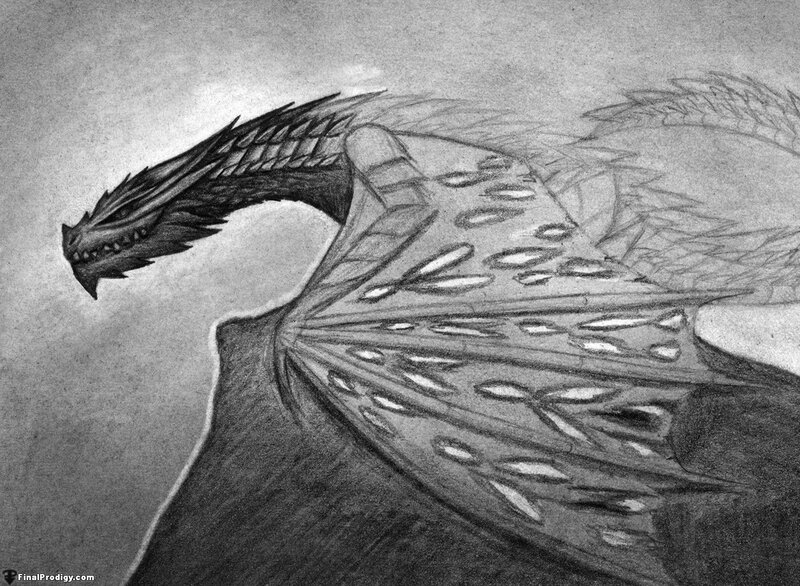 Use a sharpened 2B pencil to define the dark shading and outlines on the wyvern as well as the cliff. 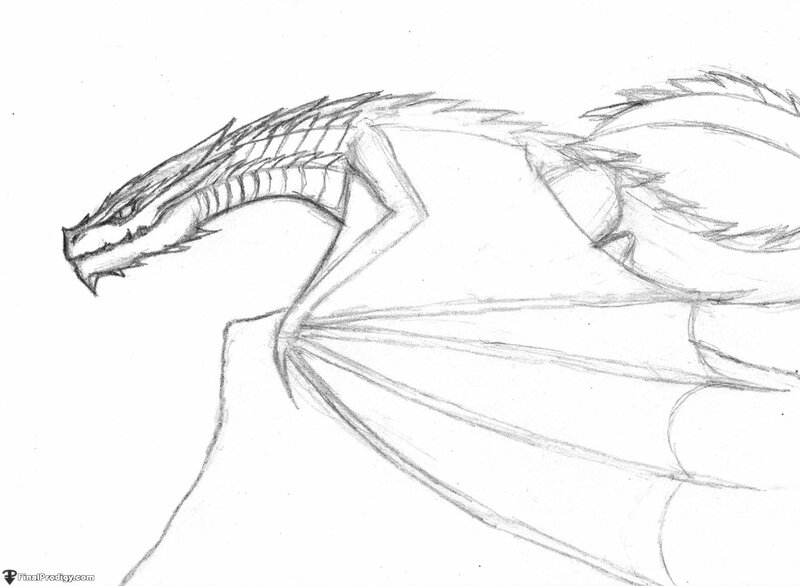 Use a 4H pencil or any hard pencil, to refine or add any small details to the wyvern itself. 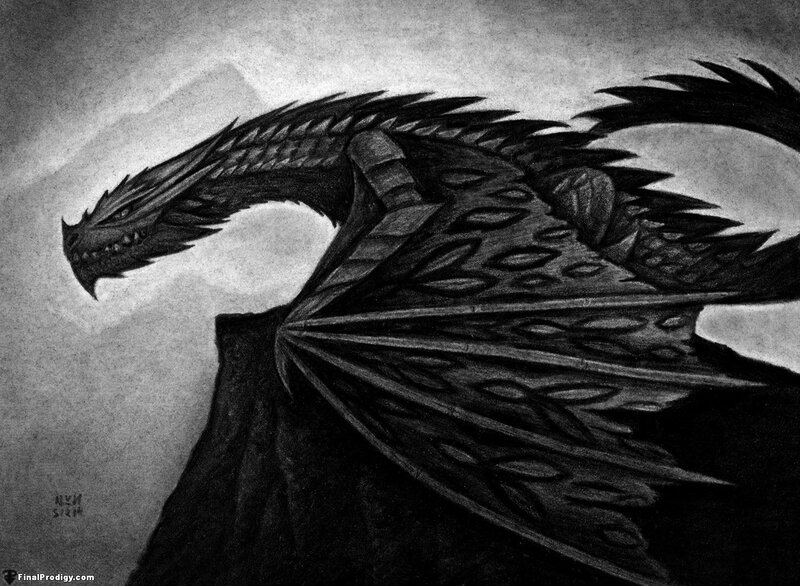 Use a blending stump and powdered graphite to smooth out the background. Define the rest of the dragon, cliff and background in the same manner. 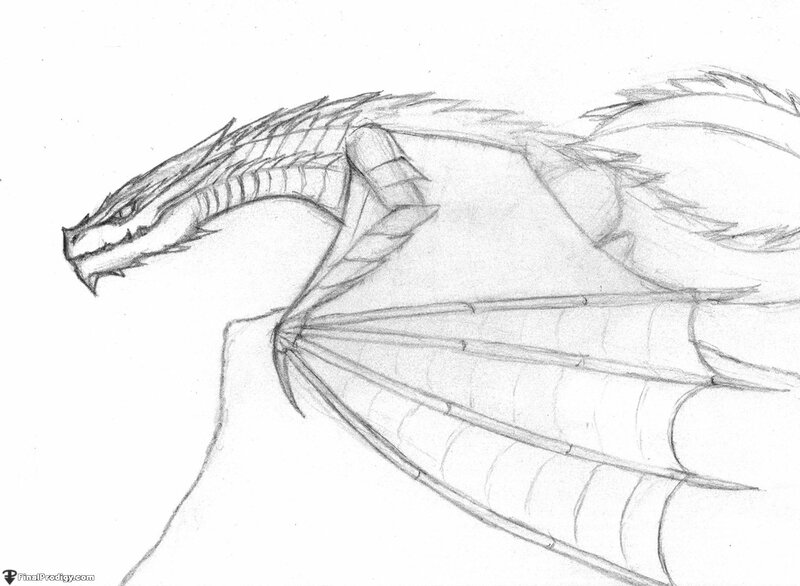 Add as much detail as you see fit in order to make this wyvern your own!